Discussion in 'People Debunked' started by Mick West, Jun 2, 2014. Someone sent me a Youtube video featuring the theories of Alan Sabrosky, billed as "Former Director, U.S. Army War College". Alan Sabrosky (Ph.D., University of Michigan) is a writer and consultant specializing in national and international security affairs. In December 1988, he received the Superior Civilian Service Award after more than five years of service at the U.S. Army War College as Director of Studies, Strategic Studies Institute, and holder of the General of the Army Douglas MacArthur Chair of Research. He is listed in WHO'S WHO IN THE EAST (23rd ed.). A Marine Corps Vietnam veteran and a 1986 graduate of the U.S. Army War College, Dr. Sabrosky's teaching and research appointments have included the United States Military Academy, the Center for Strategic and International Studies (CSIS), Middlebury College and Catholic University; while in government service, he held concurrent adjunct professorships at Georgetown University and the Johns Hopkins University School of Advanced International Studies (SAIS). Dr. Sabrosky has lectured widely on defense and foreign affairs in the United States and abroad. 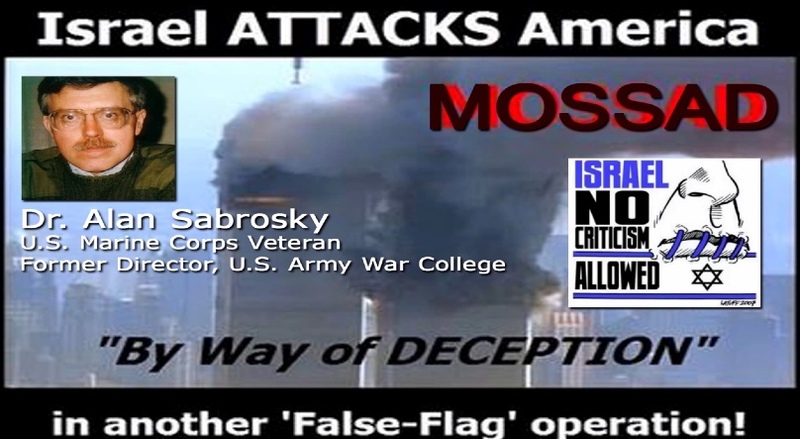 Alan Sabrosky: "Large majority of U.S. Jews are traitors" and Israel did 9/11 attacks. So who the heck is Alan Sabrosky? Sometimes, when an expert makes a serious charge but has no evidence to back it up, it's still newsworthy by dint of the provenance of the charge. The reputation of a source can play a big role in determining when to believe unverifiable charges, or at least report them with a grain of salt. Alan Sabrosky bills himself as the former Director of Studies at the U.S. Army War College. He has made quite a name for himself in recent months by first declaring himself a military expert with high-level connections in the U.S. military hierarchy, then by outrageously claiming that Israel was responsible for 9/11 and that the U.S. military knows this and is concealing it. While he offers no evidence for this, he claims that he should be trusted because of his expertise. The truth of the matter -- with respect to both his background and his claims -- is quite different, of course. Sabrosky has deliberately inflated his role in the military and has used that ruse to promote a hateful, fact-free conspiracy theory. In fact, while he did work as an administrator at the U.S. Army War College, he was not, as his job title seems to indicate, the director or dean of the college. Far from it. According to the Press Office of the Army War College, in the mid-1980s, Sabrosky served as a civilian administrator at a research department of the college, supervising the publication of papers written within that department. His job title was "Director of Studies" because he supervised publishing studies done within a department of the college. He was a mid-level civilian manager at a military college, without access to the sort of highly classified material of the sort he now fraudulently claims to have. Moreover, since his employment at that school was about 25 years ago, his employment there would provide him with no special insights with respect to 9/11. How on earth could someone who worked on the level of a college librarian in the 1980s be privy to top secret information revealing a vast hidden conspiracy? And how on earth could he be the only person to know about it or think it worth revealing? An expert, privy to the highest levels of the military elite? Over the past few years, Alan Sabrosky has become a fixture of anti-Israel media. In numerous, articles, interviews and blog postings, he literally does only two things: promotes conspiracy theories and compares Israel to Nazi Germany. As I mentioned above, most recently, he has taken this campaign to a new level of absurdity by claiming not only that Israel was responsible for carrying out the 9/11 attacks, but that most of the leadership of the U.S. military knows this and is keeping it secret in a vast conspiracy of silence. I don't know how many of thousands of officers Sabrosky includes in this conspiracy of silence, but, considering that not a single officer has broken it, it would certainly go down as the most successful such conspiracy in history if true. Only because of Sabrosky's impressive sounding resume, these reckless and baseless charges have been reposted and repeated countless times, albeit in biased and unreliable places. Looking at a more recent video, he basically just says he was convinced by looking at Loose Change in around 2009. He's simply repeating "truther" talking points, and using his supposed authority to get it heard. He brings no new evidence at all. Another appeal to authority. It does not really matter if Noam Chomsky, Henry Kissinger, Stephen Hawkins, the Dalai Lama, the King of Norway, Mary Robinson and David Attenborough do a joint press conference saying they are convinced by aliens did 9/11 with the help of some 'dancing Israelis' using space lasers, if they cannot demonstrate any evidence of this. Actually, the screenshot of the video you show was unfortunately made by careless people. There's no evidence of Alan Sabrosky himself claiming he was "Director" only "Director of Studies", however, I think you unfairly slight his achievements and stature. If it's true, he won a Superior Civilian Service Award, held a research chair, two adjunct professorships with reputable universities, and served in the Marine Corps. I got the same biography from Veterans Today that was in the video. It states he finished at the Army War College in 1988 so it's not as if it's trying to make out it's current but presumably he still has contacts. If you can find evidence that contradicts claims in this biography I'd be interested to know. At this page on Veterans Today you can see an extract from another interview by presstv with Alan Sabrosky where he mentions the reporting of the capture of Israelis the day after 9/11 (I didn't watch the one above as I've already seen more than I need.) He doesn't go into detail but invites people to do their own research. He also talks of the problem of dual Israeli-US citizens in power showing more allegiance to Israel than to the US. This seems a fair concern. Whether there is proof of it or not by definition I don't think it's good to have a significant number of dual citizens in positions of power or at least not when the other nation is involved in a major conflict and wants support for their part in it. Moderators note: Videos removed for No Click violation. "Rejoice for Christmas: No One Died at Sandy Hook or Boston Bombing!" as if it were a serious, credible resource, right?